Parmer Medical Center had its annual Employee Appreciation Dinner at the Country Rose on Friday, April 5, 2013. 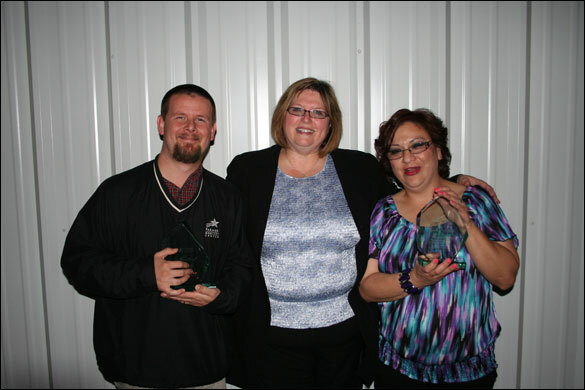 Service awards were presented and the 2012 Excellence Award winners were announced. In recognition of outstanding employees for 2012, the hospital continued to use their service excellence theme. The first Excellence Award for Employee of the Year went to Delia Jackson, Nursing Assistant. Delia was recognized for her service to patients and willingness to help co-workers within the facility. Devin Carpenter, Assistant Director of Nursing, received a second Excellence Award as Manager of the Year. Devin also was recognized for his outstanding performance throughout the year with staff and patients alike. Mike Prather, IT Director, was recognized for his work with the hospital’s electronic medical record software company, Nextgen. Mike was titled “King Ping” by Nextgen for his expertise not only for PMC but also assisting other hospitals. Five year service awards were presented to Carla Nieto, RN; April Rosas coder/biller; Kelly Santiago, RN; Susie Spring, clinic director; and Martha Torres, a/p and payroll clerk. Recognized for ten years of service were Gloria Aragon, medical assistant; Devin Carpenter, assistant director of nursing; Alan Clark, physical therapy assistant; Nimfa Martin, director of physical therapy; and Tessa Schueler, social worker. Christina Donovan, medical assistant, was recognized for 20-years of service and Joy Osborn, coder/biller celebrated 30-years with the hospital. Parmer Medical Center Manager of the Year Devin Carpenter, left, and Employee of the Year Delia Jackson, right, are congratulated by PMC Administrator Gayla Quillin after receiving their awards at the hospital appreciation dinner Friday evening April 5.